Join Colbrow Medics’ Academy and kick start your career! The Colbrow Medics’ Academy has exciting placement opportunities for those seeking to learn new skills in the healthcare field, gaining invaluable exposure and event first aid experience in a large range of scenarios, settings and locations. 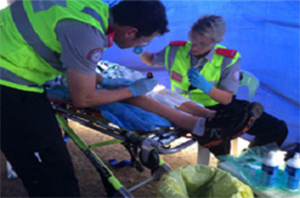 Students will be in the field, providing emergency first aid response and first aid, treating a range of injuries and illnesses under direct supervision. All students are required to hold: current Police check (completed within the last 12 month) and Working with Children check. Colbrow Medics is looking to build future Advanced Medics who are career ready, who confidently demonstrate reliability, teamwork, integrity and flexibility.